The vituperative attacks on the War on Poverty sound a little gleeful or mean-spirited or nutty—sometimes all three. A quick review of recent press coverage would lead almost anyone to think that Head Start, Legal Services, community health centers, food stamps, ESEA Title I support for education, the Job Corps, and a host of other programs had no connection to the War on Poverty but materialized sui generis to provide vital services to the poor. To the contrary, these and an array of additional programs were conceived and started as components of the War on Poverty in the 1960s and somehow survived over the years despite attacks that started on Day One of the anti-poverty movement and never let up. Aspiring presidential candidate and famous neurosurgeon Ben Carson recently denounced the Black Lives Matter movement as a distraction from more important issues of crime and jobs, but added that the $20 trillion he says has been spent on the War on Poverty has made dependency on government programs a multi-generational problem. Carson’s op-ed declares, “Poverty won. We lost.” Any recognition that there might be something wrong with an economy that relegates millions of people to working poverty via minimum wage jobs—with a wage most Republicans do not want to boost—seems to be missing from Carson’s equation, much less that the job training and job creation that needs to occur is likely to be, by necessity, government-funded. An op-ed writer named Pete Mecca writing for the Covington News declared the War on Poverty an “honorable notion run off the tracks by a sea of bureaucratic red tape fueled by taxpayer money.” He went on to note, with some justification, that “the answer is and always has been training, education, and the availability of employment,” but then implied that poor people are a bit like cattle: “Honest citizens residing in poverty react to empty promises out of desperation. Such would be the case of any individual without hope or dwelling in monolith housing projects governed by drug dealers and wannabe gangsters.” Mecca might have been usefully reminded that many of us who grew up in the projects found them quite different from the dystopian image he has painted, and despite the Pruitt-Igoe image that most people hold, many thousands of public housing units are well managed by hard-working local public housing authorities. Moreover, rather than promoting the notion that poor people simply react to whatever they’re offered, Mecca might wish to know that some of the best programs created in the War on Poverty emerged from the ideas and advocacy of poor people themselves. In the Rochester Democrat & Chronicle, a free market advocate on the editorial board, Jim Ryan, writes, “Instead of promoting policies to develop the skills and the discipline needed to earn income and encourage self-reliance, the U.S. War on Poverty has featured programs with the objective of making the lives of the impoverished more comfortable. Although an admirable goal, when a welfare check equals a pay check, the incentive to work gets decimated and along with it the income necessary to escape poverty…Unfortunately, the War on Poverty also creates incentives that have hastened the demise of the family unit.” In other words, in Ryan’s view, poor people whose lives are made “comfortable” through antipoverty programs (meaning not starving to death, not having to live in a Hooverville, etc.) are going to stay that way. It is a blame-the-victim approach to poverty: People are poor because of their own choices, their own lack of motivation, exacerbated by the anti-poverty programs Ryan sees as negative incentives. Ryan does ask us to “consider that there are over 100 million working age Americans not employed today and the workforce participation rates have fallen to a mere 62.2 percent,” though he might have recognized that the lower workforce participation rate is due to the Recession and the structure of the economy that benefits the people at the top and increasingly leaves those at the bottom in dead-end jobs or no jobs at all—not because of anti-poverty programs. To his credit, Ryan calls for eliminating the “benefits cliff” that affects poor people once they get jobs and begin to advance, a real disincentive for households at the margin, but his blaming of the War on Poverty for the persistence of poverty is totally misguided. These and other similar statements in the press abound, shaping the public perception that the War on Poverty has been inconsequential at best and disastrous at worst for people in poverty. These people don’t cite—and probably haven’t read—the analyses coming from organizations such as the Center for Budget and Policy Priorities saying that a number of federal social safety net programs lift and keep millions of Americans out of poverty, notably Social Security, the Supplemental Nutrition Assistance Program (food stamps), the Earned Income Tax Credit, the Child Tax Credit, Supplemental Security Income (SSI), and housing assistance. We would add the new availability of health insurance through the Affordable Care Act as one more federal program that has cushioned lower income households from disastrous, income-draining, poverty-inducing conditions. Despite the evidence that millions of people would sink into poverty were it not for the safety net and various War on Poverty programs, Republican budget-cutters continue to take aim at gutting the budgets of many of these federal initiatives. Maybe they think that living in poverty is a preferred, sleepwalking choice for the millions of Americans with incomes below the federal poverty level—that by slashing at the safety net, poor people will suddenly awaken to a need to leap out of poverty. Poverty, like national security, is not a problem that can be ‘solved.’ It is an ongoing obligation of a country that likes to think of itself as the most prosperous on the planet, and the growing divide between rich and poor makes it more pressing, not less. Furthermore, the “War on Poverty” is not a failure when tens of millions of Americans have a decent place to live when they would otherwise not have one, when they have food on the table when they would otherwise have gone hungry, when they have heat in the winter when they would otherwise have suffered in the cold. We know that human services agencies have long been promoting the notion of “reframing” human services. The reframing initiative is “in response to the threat of deep and potentially sustained cuts to programs critical to the human development system” and aims to get national networks “to deploy common messages to the Congress, the White House, and the American people.” All well and good, and probably necessary, but sometimes reframing sounds like advertising, a search for the pitch lines that will resonate with listeners and evoke more positive reactions. That’s fine, but something deeper is brewing when it comes to anti-poverty programs: a perception that the nation’s poor and very poor have been made comfortable through government programs, that the poor would rather opt for continued poverty because of the comfort of federal programs, that their poverty is often by choice rather than by circumstances or other factors. The attack on the War on Poverty is frequently no more than how Bookman described it, as a war against the people who are poor. Sadly, that isn’t just “framing.” It is ideological, often with an overlay of race. In addition to “reframing,” there’s a need for “re-mobilizing” and “re-empowering” the poor, as the War on Poverty was meant to do—and prevented from doing in many ways—so that the poor can tell Ben Carson, Jeb Bush, Ted Cruz, and others what they really want and need. 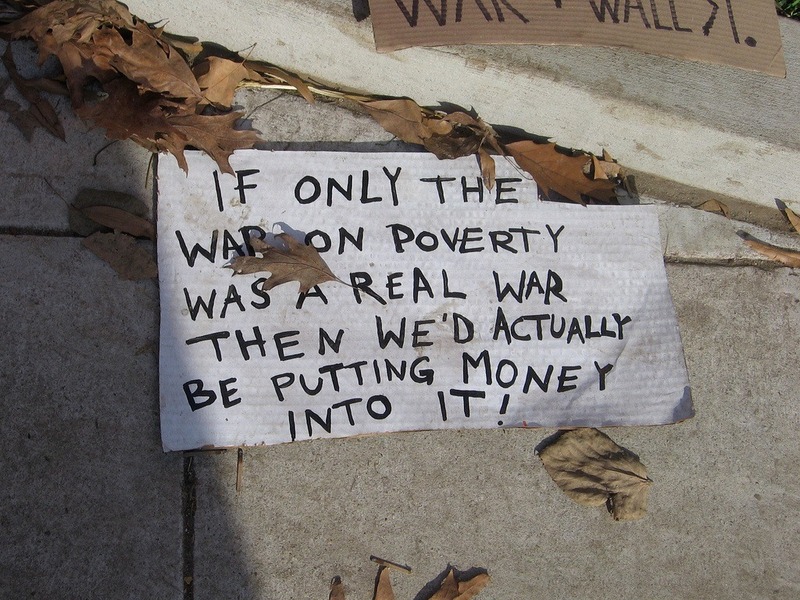 Have we ended poverty, or just changed the “frame”?